Wine of Italy. 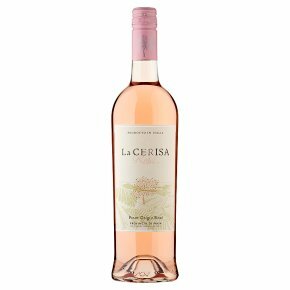 La Cerisa, local dialect for Cherry Tree, can be spotted throughout the vineyards of this refreshing, delicate Pinot Grigio Rosé Produced from Pinot Grigio grapes grown in the gently rolling hills of the Provincia di Pavia region of North West Italy, just south of Milan. A slow cool fermentation following a brief time on the skins gives the wine a lovely pale coral pink colour with delicate aromas of red berries, followed by an intense palate of ripe berry fruits and a crisp and refreshing finish. Serve chilled as an aperitif or will suit all manner of salads, seafood and cold meats.